Technical advances in the use of protein-expression systems have enabled scaled production of membrane proteins and other difficult to express proteins. These advances have also helped preserve the structure and function of the expressed proteins. Shuguang Zhang, Ph.D., associate director of the Center for Biomedical Engineering at MIT, has found that the use of short peptide surfactants in commercial E. coli cell-free systems facilitates the rapid production of membrane proteins. GPCRs, the most difficult integral membrane proteins to produce, can be produced in milligram quantities when the right surfactant is added to the cell-free system. The soluble GPCRs that Dr. Zhang’s team has produced show a-helical secondary structures, which suggest proper folding; ligand binding studies have confirmed the maintenance of biological function. The benefit of using cell-free systems is the ease of use and the ability to add components to promote protein production and stability. These cell-free systems can be maintained for a long time, though they are not amenable to repeat production. As for the addition of peptide surfactants, it is essential to screen different surfactants to ensure matching with each individual membrane protein for optimal production. The peptide surfactants that have been used are designed with a hydrophilic head (1–2 residues) and a hydrophobic tail (3–6 residues). They are usually 2–3 nm in length, their ionic character and strength can be controlled by selection of the intervening residues. The surfactants have a tendency to self-assemble to form membrane-like environments that provide stability for the membrane proteins, even though the mechanism remains unclear. Joining Dr. Zhang as a presenter at the upcoming “PEGS” conference in Boston will be Mark Welch, Ph.D., director of gene design at DNA2.0. DNA2.0’s custom gene design and synthesis service enables customers to obtain optimal protein expression for their gene of interest, according to Dr. Welch. The company is guided by informatics and experimental studies of the effect of gene usage on heterologous protein expression from different expression and production hosts (bacterial, yeast, and mammalian cells). From this analysis, the company has developed robust algorithms that predict optimal gene sequences that will provide abundant protein yields. Working with an academic partner, DNA2.0 is also exploring the optimization of protein expression of difficult to express membrane proteins as well as the effects of gene sequence on expression level and localization in differentiated mammalian tissues. Dr. Welch will also talk about Infologs™, non-natural gene variants that are designed through informatics to capture maximal structure/function correlations in the biological space of interest. DNA2.0’s research demonstrates how the technique leads to uniform sampling, systemic variance, and unrestricted information-rich results. Expression of polymerase variants (red squares) and scFv antibody variants (blue diamonds): Each point shows data from a different codon bias. 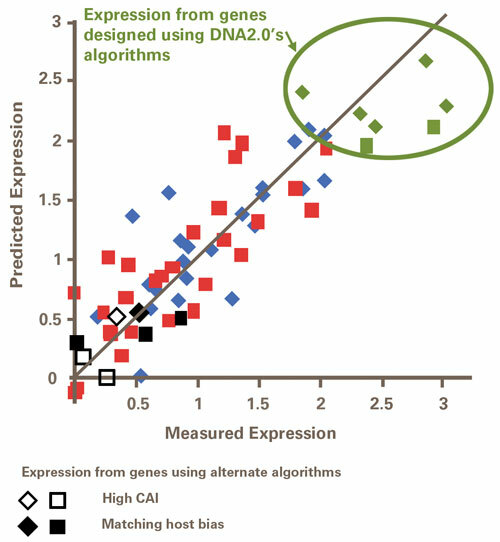 Genes designed using DNA2.0’s advanced algorithms are shown in green. Black symbols show the two major algorithms used by alternate approaches: matching the E. coli genome bias (filled black symbols) or matching the bias found in highly expressed genes (open black symbols). Ashok Bandaranayake, Ph.D., associate in the department of biochemistry at the Albert Einstein College of Medicine, will discuss Daedalus, which was developed for rapid production of recombinant mammalian proteins in human cell culture. Dr. Bandaranayake started this work when he was at the Seattle Children’s Hospital Research Institute. He is currently optimizing Daedalus for a high-throughput protein production effort as part of the Protein Structure Initiative (New York Structural Genomics Consortium). He employs the Lentivirus system, which can be used to efficiently transduce human cells. This low copy number vector (10–20 copies per genome) also has package-size limitations. With clones greater than 10 kb the viral titer drops significantly, and it has been observed that efforts to increase the copy number often result in a net negative result with increased promoter silence when incorporated into the genome. Dr. Bandaranayake has overcome the low copy number by using a strong promoter (from spleen focus forming virus). He has overcome promoter silence observation by adding a minimized ubiquitous chromatin opening element. These GC-rich sequences exist as islands of 8 kb, 4 kb, or 2 kb, all of which impact the package-size limitations. Dr. Bandaranayake has also cloned a 0.7 kb element that is equally effective in keeping expression levels high. To effectively overcome the package-size limitation, Dr. Bandaranayake has demonstrated that cells can be co-infected with vectors containing different subunits of a large protein. These subunits have been shown to readily self-assemble in the positively transfected cells. The final trick is the cloning of signal peptide encoding sequences upstream of the gene of interest to make sure the produced recombinant protein is secreted into the media. Protein secretion ensures that the protein is folded correctly and makes for easy purification. Proteins purified from serum-free media come off as a single peak from gel filtration columns. “We use serum-free adapted HEK293 cells for production of the recombinant proteins,” Dr. Bandaranayake notes. Daedalus, a robust, turnkey platform for rapid production of decigram quantities of active recombinant proteins in human cell lines using novel lentiviral vectors, was developed by researchers at Albert Einstein College of Medicine and Seattle Children’s Hospital Research Institute. Liang Tang, Ph.D., senior scientist of molecular biology and protein expression at Bayer Healthcare, is using the Lentivirus system for large-scale production of functional proteins in a family of blood coagulation factors that tends to express poorly in mammalian cells. The team is working on producing coagulation factors for research using BHK21 cells, which proved optimal for production of factor VIII; this should eliminate any variation related to post-translational modifications. Lentiviral vectors allow rapid and reliable production of protein candidates in this cell line, which is not routinely used for rapid protein production. In his presentation, Dr. Tang will discuss resource management—the time and manpower needed to produce candidate therapeutic proteins. “We have improved our approach to protein expression, which has resulted in a Lentivirus-transduced stable pool that can be harvested in weeks instead of months,” he explains. Brian Kloss, Ph.D., senior scientist at the New York Consortium on Membrane Protein Structure (NYCOMPS), will discuss optimization of high-throughput solutions for cloning, expression, and purification of integral membrane proteins in bacteria. Dr. Kloss prepares protein candidates for functional and structural analysis by others in the consortium. Earlier phases of this work focused on representative proteins from each of approximately 175 families of bacterial membrane proteins. Proteins are assigned to a family if they show 50–60% amino acid identity. From this group, 28 structures have been solved to date. Contrast that with the human proteome, where there are approximately 700 families of human membrane proteins. “I have to say that cell lysis is perhaps the most critical step when dealing with integral membrane proteins. We have helped develop a robotic sonicator arm that can safely and effectively lyse the cells without perturbing the protein within the membrane.” The process occurs in two rounds of sonication for a total of 15–20 minutes per 96-well plate. 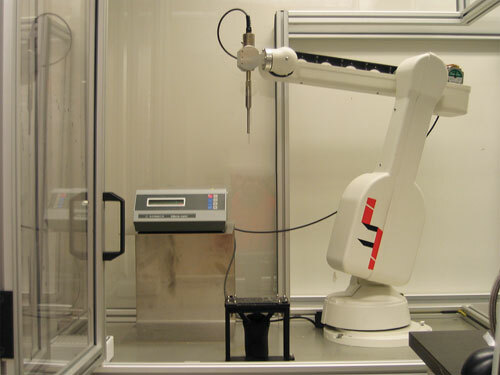 A custom-built robotic sonicator arm lyses 96 samples in a deep-well block, or six samples from mid-scale expression studies in 50 mL centrifuge tubes. Lysis of 96 samples requires only about 15 minutes, whereas it could easily take an hour, or more, by hand. Handling of up to as many as 384 samples therefore becomes routine. Automation of this type allows true high-throughput protein purification at the NYCOMPS facility.